The Georgia Swarm and New England Black Wolves met each other for the third and final time this season on Saturday night. The Swarm won a very close one by a score of 10-8, also taking the season series 2-1. Defense, and goaltending in particular, was every bit as good as the offense was in this game. There were some long offensive droughts on both sides that were caused by some unreal goalie play from Alex Buque for New England and Mike Poulin for Georgia, as well as great defensive stops. New England got things started with a Reilly O’Connor goal about midway through the first quarter. With New England holding a 2-0 lead Shayne Jackson scored for Georgia to put the Swarm on the board with 3:50 left in the first. Jackson’s goal was the start of a three-goal run for Georgia that helped them to a 3-2 lead heading into the second. 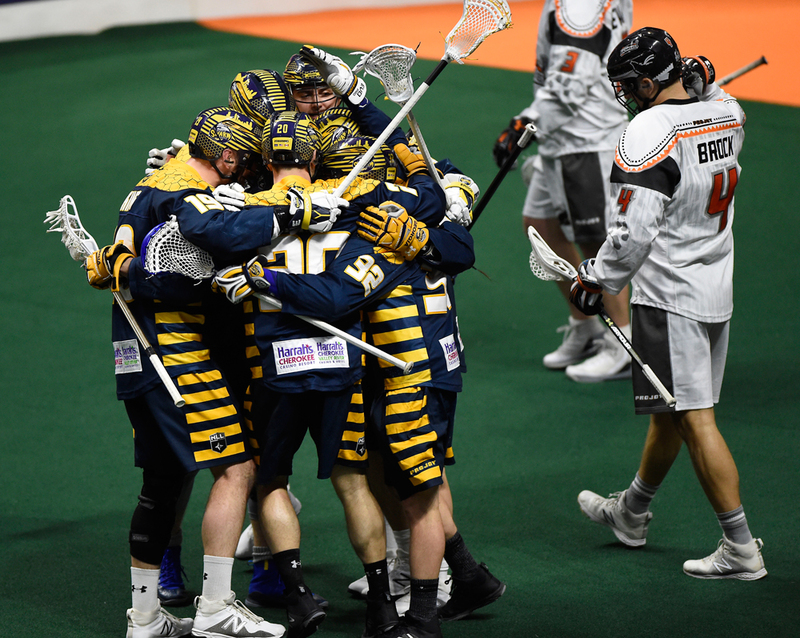 Georgia’s run continued into the second quarter as Lyle Thompson scored to put the Swarm up 4-2 early. New England would score just about a minute later as Callum Crawford made it a one goal 4-3 game. That goal from Crawford was the last of the first half as defense prevailed late in the second. New England wasted no time getting back at it in the third with Dereck Downs scoring just 14 seconds in. That goal tied things up 4-4 very early. Not even a minute later New England would see Crawford score to give the Black Wolves a 5-4 lead. Georgia responded with two of their own coming from Lyle Thompson and Randy Staats to retake the 6-5 lead heading into the fourth. It was an exciting fourth quarter as there were seven goals scored in total between the two teams. Tyler Digby got things started off for New England scoring just 22 seconds into the fourth and tying things up again. Georgia went on an early three-goal run started by Holden Cattoni. That run really helped the Swarm create some more separation as they held a 9-6 lead. New England wouldn’t go away easily as they were able to march back and make it a one goal 9-8 Georgia lead late in the game. Thompson’s hat trick goal with 5:30 left in the game secured the 10-8 win for Georgia. The Black Wolves tried to make a push in the last few minutes but Georgia’s defense and Poulin prevailed. New England was led on offense by Reilly O’Connor and Callum Crawford. O’Connor had six points (3G/3A) while Crawford tallied five points (3G/2A). On defense for New England Colton Watkinson caused a turnover and scooped up three loose balls. Georgia was led on offense Lyle Thompson’s seven points (3G/4A). Randy Staats also played a big role with four points (2G/2A). On defense for Georgia, Jason Noble caused two turnovers while also chasing down six loose balls. Defenseman Chad Tutton helped out on offense with a goal. Buque made 41 saves off of 51 shots on goal for New England while Mike Poulin made 38 saves off of 46 shots on goal for Georgia.